​and thanks for checking it out! There are many pages, which contain information about concerts, teaching (USC & Colburn), former students, private lessons and masterclasses, music samples & CD's/Music for sale, articles I have written, and lots of photos/videos of my family, friends, and performances. ​ I hope you enjoy navigating the site. See the Events page for more information on Jim Walker Concerts and Classes. audience that didn’t love his powerful, “stand and deliver” performances. His star began to rise when Jim was named Associate Principal Flute in the Pittsburgh Symphony after a stint playing in the US Military Academy Band at West Point. He quickly gained the admiration of colleagues and audiences in Pittsburgh and set his sights on Principal Flute jobs. After eight years he won the Principal Flute position in the Los Angeles Philharmonic and never looked back. To be Principal Flute of a major orchestra is to sit at the pinnacle of the profession. Most flutists who reach that height are content to spend the rest of their careers there, but Jim but Jim felt an eagerness and aspiration to move his music-making forward yet again. After seven successful seasons of performing, recording, and touring with the Los Angeles Philharmonic—during which time the New York Philharmonic briefly borrowed him as Principal Flute for their 1982 South American tour—Jim left the orchestra, diving off the mountaintop into the world of jazz, studio recording and a commitment to teaching. and internationally renowned flutist and conductor Claude Monteux. Jim’s gratitude to his teachers is returned to him by his students. 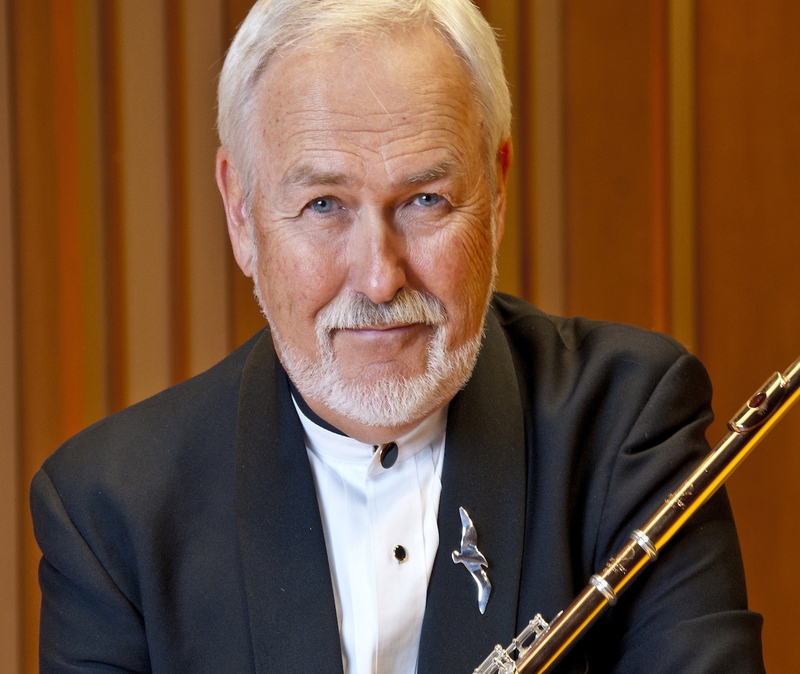 As Professor of Flute and Chamber Music at The Colburn Conservatory of Music, as Professor of Practice at the University of Southern California’s Thornton School of Music, and at The Music Academy of the West, Jim devotes the majority of his time steering the careers of young flutists. Before coming to Los Angeles, Jim’s teaching career included positions at Duquesne University, Carnegie-Mellon, and the University of Pittsburgh, and since arriving in Southern California he has been invited to be visiting professorat the University of North Texas, the University of Texas-Austin, and Arizona State University. Jim has taught hundreds of flutists both privately and at these renowned institutions. Many of them have gone on to successful orchestral careers, holding Principal Flute chairs in major symphonies from Phoenix to Boston to Beijing. Still others have careers in fields as varied as gospel music and arts administration. Jim is not interested in simply training musicians; he inspires each pupil as a whole person, and students leave his tutelage feeling empowered, reaching for the stars. With such a legacy, it is no wonder that students on four continents have flocked to hear his recitals and master classes. Jim’s creativity allows him to reach not only these students but also others he never sees with his editions of flute masterworks on the Alfred Music Publications Young Artist Series. so that future generations can continue to benefit from his wealth of knowledge and generosity. in his biography of 1990, called “Jimmy” his “favorite jazz flute player”, Jim was a bona fide “jazz flute man”. Life was equally good for Jim Walker in LA’s famed studio scene. Until June of 2010, he was a first-call studio flutist for the better part of two decades; his bold, expressive playing can be heard on hundreds of soundtracks and commercial recordings. His playing became the gold standard from Hollywood to Carnegie Hall and unlocked the door to studio and concert collaborations with everyone from John Williams and Paul McCartney—“the thrill of a lifetime,” says Jim—to Leonard Bernstein, James Galway, and the LA Guitar Quartet. Dynamic soloist, legendary orchestral and studio musician, celebrated jazz flutist, and an inspiration to countless students worldwide; Jim Walker is living proof that with enough creativity and determination, one can reach the stars. ​He is a living legend, and a true Renaissance Man of the Flute.